Would you like a guitar package? See what’s included with each package. We have thoroughly inspected, seasoned and adjusted this guitar to exacting specifications. This is a minimum 10 day process which results in this guitar being very easy to play and having a pleasing, well balanced tone. We inspected this guitar for quality construction and finish before we invested time in seasoning and adjusting. Next we tuned the guitar to standard pitch and hung it in a temperature and humidity controlled room for a minimum of 9 days. This allows the woods to settle and stabilize under tension and prepares it for our adjustments. After the 9 day seasoning process the truss rod was adjusted to give the neck and fingerboard enough relief to allow for the vibration arc of the strings over the length of the fingerboard. This allows for easy playability without string buzz on the frets. We cut and filed the bridge saddle to the proper height for easy playability (action) up and down the fingerboard and filed the bottom flat and smooth for maximum energy transfer of the strings through the saddle and bridge to the guitar top. This helps produce the best balanced tones and overtones. Next we cut the nut slot of each string to an exact depth for proper string height (action) above the first fret. This helps to make the guitar extremely easy to play, especially in 1st position. This guitar is easy for kids to hold and the width of the fingerboard is perfect for the hands of the young player. In almost every aspect this guitar is properly proportioned for kids. This guitar along with our seasoning and adjustment process helps to make it easy for kids to be successful in learning to play the guitar. The sound is balanced and clear which helps in early ear training. The guitar “feels” right to play and kids are excited to play it as it looks like a full size guitar, only it fits them. The internal construction and braces are the same as full size guitars, but in a smaller version and the fingerboard meets the guitar body at the 14th fret just like a full size guitar which helps young players easily transition to the next size guitar. Another great feature is that it has machined tuning gears. Kids will have a greater opportunity to learn to tune earlier and do it better. This is quickly becoming one of my favorite guitars for my young students to play. In almost every detail it is perfect for them to play and learn on. If I could could change anything I would have it designed with a Concert or Orchestra Style body size which is slightly smaller. 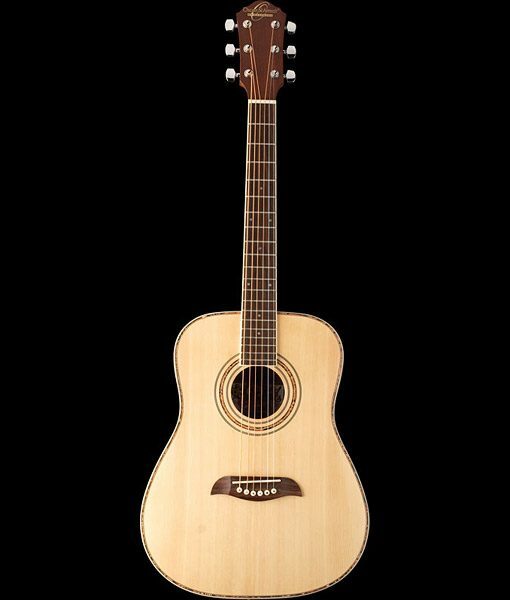 The Dreadnought body style is an over sized design and has been the most popular acoustic guitar body style for decades. Over the past several year the Concert/Orchestra Style body has gained in popularity as players are discovering they are comfortable to hold and have a balanced and slightly less bass sound. However, I must admit that I play my dreadnought almost everyday of the week. This is an amazing little guitar. 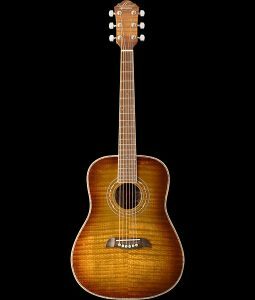 Built with the same features and designs as well made full size guitars, but only a smaller version. 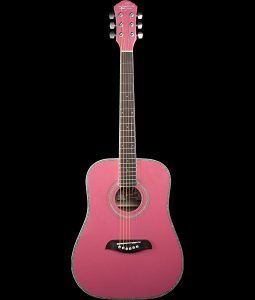 It is the right size for kids in almost every detail and they will easily transition to larger guitars as they get older because the basic designs of this entire line of guitars is consistent. The only difference being the age appropriate sizes. Because this kid size guitar is so well made, it is much easier for us here at FirstGuitar to season and adjust as compared to cheaper, lower quality guitars. As a result, we can present you with the best sounding and easiest playing guitar possible. The woods are more stable and can hold their adjustments better with the proper care. This guitar can actually be played by the younger player. They can learn to play notes and chords that ring clearly and develop proper playing technique with the guidance of a good teacher. This after all, is what every parent and teacher wants for kids who have expressed an interest in playing the guitar. Their education is affected by the playability of the guitar and the materials they have to work with. You will find it very easy to teach children on our FirstGuitar Custom Adjusted Guitar because we have inspected, seasoned and reworked this guitar at the neck, saddle and nut so it is extremely easy to play. 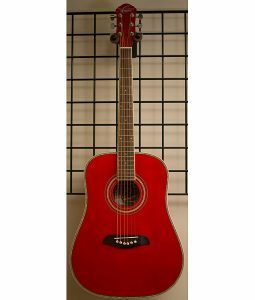 This guitar will enhance the teaching and learning process because it is so easy for kids to play notes and chords clearly. 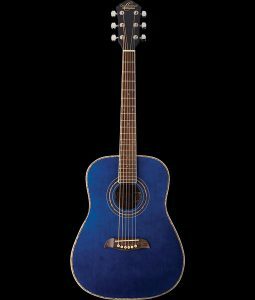 In particular, this Oscar Schmidt guitar has a smaller nut width and thinner neck profile which is just right for the hands of young players. 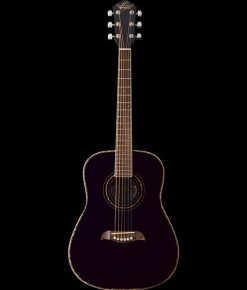 This guitar is very well constructed and possesses a rich balanced tone which is enhanced with a Nubone saddle and nut. You will be surprised by the tonal quality of such a small guitar and the balanced tone will make a great contribution to early ear development. This guitar is the right size, easy to hold, easy to play and sounds great. You can spend your time doing what you do best – teaching the joy and excitement of learning how to play an instrument – without the instrument itself being a barrier to learning. Our FirstGuitar Custom Adjusted Guitars will make it easier for you to teach and easier for your students to learn. No greater than Light Gauge Strings .012 through .054. All measurements to the nearest 8th inch. Catalpa*is a very sustainable hardwood and tends to be on the softer side of the hardwood scale. It has a straight grain and superb stability with very low shrinkage rates. It is relatively easy to work and glues and finishes well. The general appearance is somewhat like ash. We are so confident in the quality and easy playability of our guitars that we offer a 100% Money Back guarantee. If within a 30 Day Trial period you don't find our guitars to be the easiest to play in their class, we will refund the purchase price of your order. See our Return Policy for details. Inspected and adjusted to the specifications of Jim Thomas, founder of Thomas Music Co. and co-founder of FirstGuitar.com. No one knows the needs of the new player better than a dedicated professional music/guitar teacher. For this very reason every guitar that comes through our doors goes through a 26 point inspection and adjustment process. This is your guarantee of a guitar that is selected, inspected and adjusted so you can experience greater success in learning to play the guitar and develop proper technique. See our Inspection and Adjustment process.